Cape Town – The Sharks got the full-house victory they desperately needed in Bloemfontein on Saturday ... but it was a win tempered by a significant player setback. 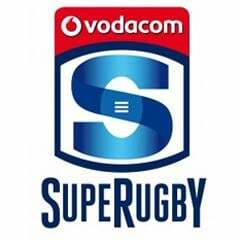 They rumbled rather than dazzled their way to a 27-10 Super Rugby triumph over the Cheetahs, which sees them surprisingly well placed at sixth overall after the weekend’s activity, albeit in a heavy mid-table “traffic jam”. Yet any hopes of a more sustained revival in the competition by the Durban-based side may well have taken a huge dent by the likelihood that their gifted young Springbok lock Pieter-Steph du Toit has suffered another knee injury that could keep him sidelined for some time. The 22-year-old at least returned to the bench for the second half on crutches and wearing a brace, perhaps indicating that the setback before half-time may not be quite as serious as his anterior cruciate ligament tear that put paid to most of his 2014 season. A proper medical report from the Sharks camp was still awaited at the time of writing, but it nevertheless appears as though the mobile, multi-skilled tight forward will miss a few weeks of Super Rugby at the very least. Du Toit is a critical component of a team which has badly under-delivered in early season and still showed some limitations in the finesse department, frankly, in the comfortable victory over the limited Cheetahs. He brings youthful balance and energy to a first-choice tight five which, as presently constructed, looks more than a little long in the tooth, especially as another of their more up-and-coming locks, the lanky Stephan Lewies, 23, is also still absent as he recuperates from a long-term injury. Once Du Toit left the Bloemfontein pitch on a buggy, the tight five became Tendai Mtawarira (29), Bismarck du Plessis (30), Jannie du Plessis (32), Mouritz Botha (33) and the much-travelled substitute second-rower Marco Wentzel (35). 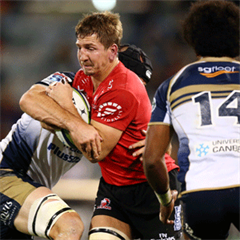 Remember that Super Rugby-proven Anton Bresler left the franchise last year for a new career in Scottish club rugby with Edinburgh. While the Sharks were terrifically physical and industrious on Saturday, with stalwarts Marcell Coetzee and Frans Steyn to the fore, their all-round game still looks well short of getting them talked up as possible title material – and next weekend they await the tricky visit of a Chiefs side which earned a brilliant win against the previously unbeaten Stormers at Newlands. The earlier game, further down the coast, had been of such contrastingly high quality that former Bok flyhalf Naas Botha was moved in the SuperSport studio to say the Bloemfontein follow-up “looked like it was played in slow motion”. The Stormers’ 28-19 reverse, after they had led by three points at the break, brings the SA conference contenders back much closer together: closest challengers the Sharks are now only five points behind them and the Bulls a further point in arrears in third. With the Capetonians on a bye now, the Bulls look especially likely to make up much ground when they host the Force at Loftus on Saturday in a game they should be quite hotly tipped to take. Still, it is not as though a youthful Stormers outfit have reason to feel their challenge has been badly derailed: in pre-season they would have happily banked a situation of four wins from five matches ahead of their first rest week. Sooner or later, they were going to cop one from a more street-smart team, and for good passages at a near-packed Newlands they went thrillingly toe to toe with Chiefs superstars like Sonny Bill Williams, Liam Messam and Aaron Cruden. They should put it down as a good learning experience, and one that could be beneficial for their looming Australasian tour. While there could be no doubting the degree of the Chiefs’ dominance and slick ball-in-hand superiority after half-time, the Stormers also did themselves no favours tactically as they failed to earn even the solace of a losing bonus point. On a hot day, they had obliterated the Chiefs scrum in the first 40 minutes and that looked like a promising platform for tiring out the Chiefs, who hail from more temperate climes, as the game wore on. Instead rather the opposite occurred as the clearly well-conditioned Waikato outfit gave the ball plenty of air and enjoyed rich territorial dominance – they also turned the scrummaging tables, a big gee-up for them, once the Stormers hauled off their impressive full starting front row of Steven Kitshoff, Scarra Ntubeni and Vincent Koch. The Stormers may rue, too, not letting substitute flyhalf Demetri Catrakilis, who seldom misses, have a crack at the posts when they had two chances in the dying minutes to get back within seven points and at least take home something for their herculean efforts. For the first time in the competition this season, there are no SA derbies in the next round, so four teams from our shores tackle Australasian opponents, two at home and two abroad.